When we carried on more south along Carretera Austral, the weather again changed, but after being in Patagonia for couple days already, it did not surprise us at all. From changeable weather affecting our hiking adventures in Pumalin National Park, where we experienced sunny and rainy times with ten minutes frequency, and Queulat National Park with Hanging Glacier, where a strong downpour locked us in our room for a whole day, we arrived in Villa Cerro Castillo, where blue skies, sunshine, and annoying horse flies awaited for us impatiently. Cerro Castillo National Reserve lies just a stone's throw from a small village Villa Cerro Castillo and less than 100 kilometers from Coyhaique, the biggest city along Carretera Austral which makes it a popular destination for travelers looking for a rewarding one day hike. 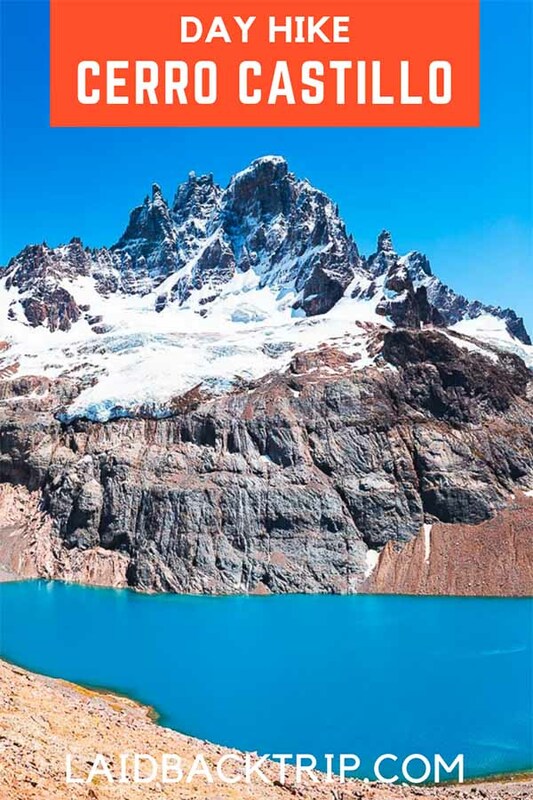 The national reserve is the best known for the famous four days trek (you need to be self-sufficient), but the good news is, that the most beautiful view of the multi-day hike, the sparkling blue glacial lake sitting at the base of towering Cerro Castillo (Castle Mountain in English) is easily reachable in only one day from Villa Cerro Castillo! If you travel Carretera Austral and do not plan to carry on to Torres del Paine National Park in southern Chile or Glacier National Park in Argentina with famous Fitz Roy peak and Perito Moreno Glacier being the most notable reasons to visit, the hike to Cerro Castillo Lagoon should be definitely on your itinerary as many travelers say it is as good as Torres del Paine or Fitz Roy, only without crowds and because we've visited all places mentioned above, we can only affirm those rumors to be true. When we arrived in Villa Cerro Castillo, we went straight to the visitor's center to get up-to-date information about bus schedule and the hike. What a surprise when the staff member told us it is closed and if we want to go, we should be careful, but when we asked what does it mean, he was not able to explain (or he did not want to or couldn't), just repeated be careful. Later, we found out that to start the trek, hikers must cross private property, and the owner of the property used to charge an entrance fee (CLP 5000 - 10 000), but the park management ordered him not to do it as he was putting off travelers. Since then, the entrance is free, and you will be ignored when getting over the fence, but because of the dispute, it seems that locals try not to officially encourage people to do the hike only to strive for good neighborhood relations. And where to start? When in the village, get to the main road near the visitors center, turn right and then turn left to the first unpaved road. Follow the road until you reach a bridge and turn left. Here you will find a small parking lot and a fence on your right. To get on the trail, you must get over the fence, and from here you will see a clearly-marked path to Laguna Cerro Castillo. There is no entrance fee on this side of the natural reserve. There is also another way how to start the hike to Cerro Castillo, and you can do a loop instead of hiking the same way back, but we did not find this option very interesting, although views along the way will surely be rewarding. When you reach the parking lot, instead of crossing the fence, follow a dirt road for around six kilometers until you reach a ticket booth. Here you must pay CLP 10 000 per person, and you can start your hike to Laguna Cerro Castillo from the opposite side. We found the entrance fee pretty steep and did not want to walk the boring dirt road for 6 km, those were reasons why we decided to hike to Lake Cerro Castillo from the parking lot and return the same way to the village. We've already mentioned, you don't need to pay an entrance fee when hiking from the village, but you have to pay CLP 10 000 when starting (or returning) from the farther point of entrance. You also have to pay the entrance fee CLP 10 000 when hiking the multi-day trek in Cerro Castillo National Reserve. The hike to the lake with 2320 meters high Cerro Castillo peak towering above it takes approximately 6 hours total (with some time spent on a viewpoint), the hike's length is 9 kilometers one way. The altitude gain is almost 1100 meters so be ready that it is not a casual walk in the park. The hike is pretty much straight forward: you need to follow orange trail markers along the way. Together with a great hike in unspoiled Patagonia National Park, this was definitely our hardest hiking experience on Carretera Austral. When you get over the fence, continue, as you will soon pass several farmlands. In about ten minutes, the trail will lead you to the forest, and from here the path starts to climb up. Very soon the views open up, and you can see mountains around, a river snaking through the valley and even lakes near the Chile - Argentina border (Read more: Villa O’Higgins - El Chalten Broder Crossing and What to do in Villa O’Higgins guide). The first and the last section of the hike to the lake is quite steep while the middle section is more up and down. When you reach the viewpoint overlooking the lake and Cerro Castillo mountain, you can either turn back and head to Villa Cerro Castillo, or you can carry on for another hour to a higher hill on your left (when facing the lagoon) for better views of the other side of the natural reserve. It is totally worth it, but do not forget your wind-proof jacket, the wind up there is really strong. When traveling from the north of Carretera Austral, you need to get to Coyhaique (as it is the largest city, it is not difficult to reach it) and here you have two options. Either do a one day trip to Villa Cerro Castillo and return to Coyhaique the same day or get to Villa Cerro Castillo and stay there overnight. Either way, you need to take a regular bus from Coyhaique's bus station which leaves at 8:30 AM every day (in case you decided on a one day trip), or there is also another bus leaving at 4 PM from a parking lot near Unimarc shopping mall. To get back to Coyhaique, you must either hitchhike or wait for an afternoon bus coming from Rio Tranquilo, home of Marble Caves (times varies). At first, we considered visiting Cerro Castillo on one day trip from Coyhaique for several reasons. First, accommodation on online booking sites was too expensive in the village, and we also read that the hike is popular, and it is hard to get out from the villages because of the number of hitchhikers and crowded buses. But later, we decided to risk it and glad we did. If you are looking for the most up-to-date bus schedule, the best is to stop by in the small information center in Villa Cerro Castillo. A bus to Coyhaique usually leaves in the morning, and all passing by minivans from Rio Tranquilo or Cochrane stop here as well. If you carry on the south, to Rio Tranquilo, two or three minibusses stop in Villa Cerro Castillo between 11 AM and 12 PM (it is better to be there around 10:30 AM). There is not a bus station so you must stand next to the main road and wait patiently. It is also not possible to buy a bus ticket in advance. It is true, that when we came, there were many hitchhikers along the road, and all of them were unsuccessful (at least for one hour we waited for the bus to come), so in case this is the only mean of transport you are using on your travels, it is better not to be on a tight schedule when traveling from Villa Cerro Castillo. When minivans arrived, there was a bit of hassle to secure our spots, but at last, all people got the ride that day. The ticket cost CLP 10 000, and the drive takes three hours because the road is unpaved. Fortunately, also our fear regarding an expensive accommodation turned out to be irrelevant as we were able to find a homestay for CLP 10 000 per person without reservation, but in case you prefer to have everything set before your arrival, you have one option in Villa Cerro Castillo. Mid-range: Refugio Cerro Castillo - Despite the name, it is the most luxurious yet reasonably priced place to spend a night in the village (and the only one bookable online at the moment via Booking.com). The bed and breakfast hotel is newly renovated and offers astonishing views of surrounding mountains.